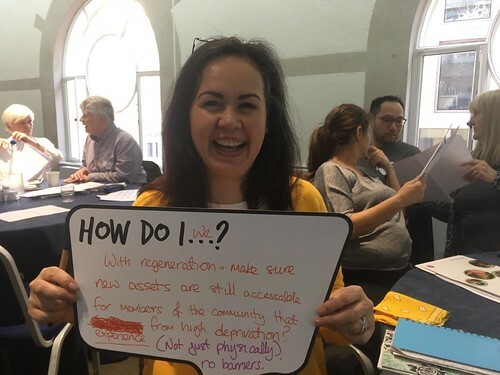 We’re offering fantastic new support for Big Local partnerships who want to work with passionate and committed social entrepreneurs in their areas to deliver Big Local plans and priorities. We know that you want a great future for all your residents and that you want to nurture local talent. We can help you do this and ensure there is a real legacy for your Big Local area with opportunities for those who have not had them before. UnLtd’s previous work with Local Trust has demonstrated that social entrepreneurs and the ventures they run create real benefit for local residents. Social entrepreneurs can create services that really fit local needs because they live there too. For example, you can read about how social entrepreneur Rachella Sinclair has helped build community markets and local enterprise in Noel Park Big Local or how Sam Delaney’s social enterprise is helping recovering drug and alcohol users in North Cleethorpes Big Local. We are looking for ambitious Big Local Partnerships with a commitment to working with social entrepreneurs and who are willing to invest £50,000 over three years. In return, UnLtd and Local Trust will invest an additional £100,000 of support funds over those three years to each Big Local area they work with. UnLtd will work with you to create customised support for social entrepreneurs in your area, helping them to access new markets and investment streams and develop new resources. Each area will be different. Our activity might include gathering inspiration from successful entrepreneurs elsewhere, thinking about what entrepreneur support might look like in your area and finding additional money or markets for your social entrepreneurs. This is an exclusive opportunity – the programme of support is available to only 20 Big Local areas in England. It will be based on a three-way collaboration between Big Local partnerships, Local Trust and UnLtd. If you’re interested in taking up this offer, email me, pamhardisty@unltd.org.uk as soon as possible. I’ll put you in touch with the UnLtd Award Manager who looks after your area of England. They will talk things over with you around your Big Local partnership’s ambitions, the challenges you face and whether this approach is right for your area. If your area decides to proceed, the Award Manager will ask you to submit an expression of interest by mid-July 2017.